I’d be willing take a punt there aren’t too many people who could hold their nerve while 90,000 fans wait in silence for them to make the match winning kick of the premiership rugby final at Twickenham. I can tell you for certain that I’d be a bundle of nerves with legs like jelly, that’s for sure. Well one man did and yes, today I have the absolute pleasure of asking Exeter Chief’s talisman, number 10, Gareth Steenson some questions for the blog. One man has been there through all of this. That man is of course the star of this blog – Gareth Steenson, affectionately known as Steeno to the fans. Leading from the front, kicking hundreds of points in a consistency that never ceases to amaze me. Did I mention that in the game where they won promotion to the premiership he scored 24 of the winning 29 points? Did I mention he kicked the penalty to take the 2017 final into extra time before doing it again shortly after to take the premiership crown? I’ve always been fanatical about sport (just ask my wife Lizz) and truly believe in the parallels between it and business. Whether you look at the competition and the desire to win or simply the organisation of different personalities within teams, there are so many shared lessons. So today I’m honoured that Gareth has taken time out of his training to answer these questions for us. I hope you’ll enjoy them as much as I have. 1). Gareth, what’s your greatest ever achievement? To date, winning the Premiership last May. Although being part of the team that stayed up in the first year of the premiership was a huge achievement. 2). When you were looking down on the ball in extra time to make that final kick of the premiership final and 90,000 people were staring at you in silence, what goes through your mind? The final kick in extra time was not as bad as the kick beforehand to take it into extra time. I tried to focus on my kicking technique that I’ve had for years and trust it. I had been kicking well at posts all day, throughout the warm up and the game had itself, so I was confident in myself. I viewed the final kick as a chance to win the game as opposed to losing it, so I was very positive about it. Also, I said a little prayer to to my Dad asking if he could help me out with the kicks which I’ve no doubt he did. When I left school I was part of the Ulster Rugby academy, playing in the Ulster Under 19/21 Squads. I was selected for Ireland Under 19s World Cup & for Ireland Under 21s Squads for 2 years(6 Nations & World Cup), Captaining the Squad in my 2nd year and winning the Golden Boot at 2 consecutive World Cups. After the Under21 World Cups I was part of the senior Ulster Rugby squad for a couple of years before joining Rotherham & Cornish Pirates, each for a single season before making the move to the Exeter Chiefs and the rest they say is history. 4). What does a normal training session look like for you? Our training sessions differ from day to day and session to session, depending when the match is on that particular week. 5). What’s the best strategy you’ve come across for winning consistently. Understanding what your strengths & weaknesses are both as an individual and a team and continually working on your strengths. I believe once you know and understand your strengths, work harder at them to make them stronger. 6). 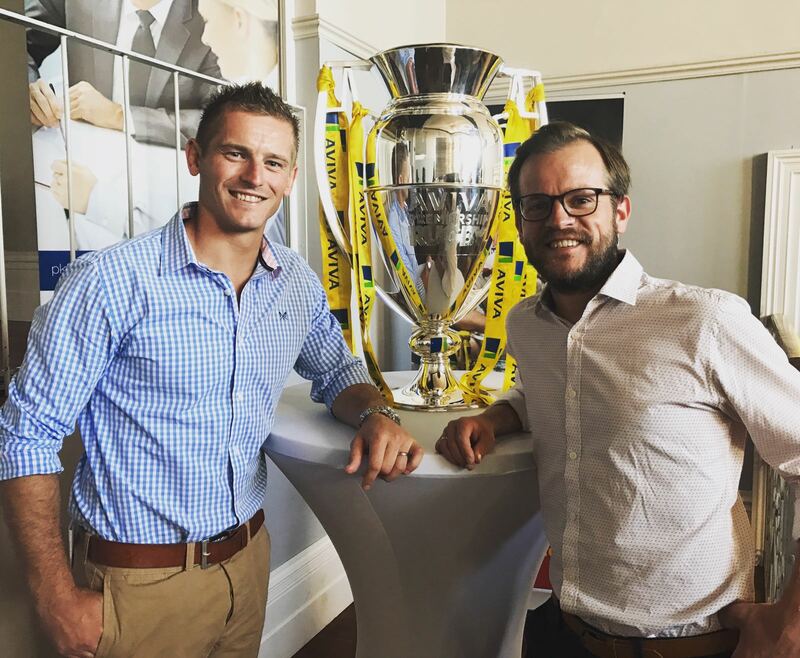 Is there anything you think business can learn from Rugby? Building a culture of trust amongst colleagues is crucial. If people are comfortable with one another to be able to challenge each other without the fear animosity, I believe that can bring the best results. Also investing time in social relationships between individuals within the workplace creates a more efficient and effective working environment. Having Fun. 7). What time are you up in the morning and what time is lights out? Up anywhere from 6.45 am with the kids & lights out from 10pm. 8). As a captain how do you get the most out of different team members? With any leader I think it is vital that you show the qualities you are looking for in your teammates in yourself first. Understanding differing characteristics of individuals within the team, knowing what makes them tick and creating an emotional attachment amongst the group to achieve a common goal. 9). How do you pick yourself up after losing a big game? My two young sons pick me straight up, they have me out in the garden kicking with them. 10). What does a standard day look like (if there is such a thing)? A typical training day for me is breakfast 7.45am, followed by a kicking session at 8.15. Weights follows that at 9.30am,with a team meeting at 11.15am followed by our main rugby session at 11.30. A recovery session after the pitch session usually beginning at 1pm with stretching / ice baths / massages follows with lunch afterwards. This is usually our final prep day of the week which is a Wednesday if we have a Saturday game. Its our shortest day of the week. 11). Do you set any sort of goals? Long term goals are to win as many trophies as possible. Short term goals is always to put myself in the best possible position to win the game at the weekend and perform to the best of my ability. 12). How important is looking after your health and diet? Huge for professional sport. It helps with not only being able to be in the position to perform to the my max in games but to help with recovery and rehab of injuries. 13). How important is the atmosphere in the stadium in helping or hindering a team? The atmosphere is huge for the team, it drives the team on and gives us a huge lift as well as maybe intimidating the opposition. Play your own game. Enjoy your mistakes today so your better for them tomorrow. 15). What’s after Rugby for Steeno? 1). Who is the hardest working player you’ve played with or against? Hendre Fourie. (played with him at Rotherham) Not many can play 60 mins in the back row, then move to Tighthead prop for the last 20. 2). Most impressive player you’ve played with or against? 3). Best team you’ve played against? 4). Fave social media site. 5). Who is your inspiration? I’ve read and re-read this article a number of times thinking how lucky I am that Gareth was good enough to do this. A huge thank you to him and the club for letting it happen.